Since our guest bathroom is hardwood, the plumbers had to wait until the floor was in place before installing the fixtures. The toilet and pedestal sink were both installed on day 69. 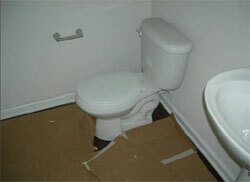 Installing a toilet is one of those jobs that no one can afford to do less than flawlessly. Any fault, no matter how big or small can lead to a disaster. Although it may seem very scary, toilet installation can be done even by non professionals, with the help of a step by step process as a guide. 1. The very first thing to do is always prepare. The water supply to the toilet must be turned off. Make sure all the toilet parts, bolts and nuts needed for the installation are complete. Handle toilet pieces with extra care for they are made of porcelain and can easily break or be damaged. Take the necessary measurements and make sure everything is of the right size or length. For example, the hole in the floor must be large enough for the closet flange to fit; check the fitting of the soil pipe and closet bend; etc. 2. The next thing to do is to install the soil pipe. After the application of PVC primer and PVC cement, quickly fit the soil pipe into the closet bend. Do the same prime and cement application to the other end of the soil pipe and inside one end of the closet flange. 3. Then firmly fit the flange into the soil pipe. It is important that the collar is resting on the floor, do this by pressing down the flange until the collar and the floor are touching each other. Attach the collar to the floor with the non-corroding screws made of brass or stainless steel. 4. Securely slide the long closet bolts into the flange's slots and put washers that will hold them into place. Position the wax ring on top of the closet flange. 5. Hold the toilet bowl on top of the floor opening and align the bolts into position before lowering it. Gently press down the bowl until the base is in contact with the floor, be careful not to shake or rock or over compress the bowl while doing this. 6. Slip a steel washer onto each of the bolts. Secure the foot of the toilet bowl by adding nuts over the washers, then gently and slowly tighten the nuts and make sure it's not overdone, as this may cause the bowl to break. Slightly wiggle the toilet bowl and if it does not shift or move then it is probably tight enough. Lastly, trim the bolts with a hacksaw. 7. Prepare the tank for installation. There is one large hole and one small hole on its bottom, the small opening for inlet water supply and the other large one for flushing. If gaskets aren't preinstalled, fit each to its proper opening. Putty can be added to the bolts and washer to prevent leaking. The same thing can be done to the hole in the toilet bowl using silicone grease. 8. The tank is now ready to be installed. In the same manner as installing the toilet bowl, hold the tank on top of the bowl's inlet positioning the bolts correctly. As the wax ring, the gaskets join the tank and bowl together. Firmly tighten it into position adjusting the bolts from below the tank while holding them with a screwdriver on top (inside the tank). Check the back of the tank and make sure it's parallel to the wall as much as possible. 9. To start hooking up the water supply, install the threads for the angle-stop connection before anything else. The supply line is an over braid hose, which is durable against bursts yet very flexible, curve it and fit into the stop-valve and tank's water supply holes. Make a loop or cut the hose if it seems longer. Tighten the nuts. 10. Add the toilet bowl cover and test the flush six times. Check and repair leaks if necessary. Installing a toilet is not as difficult as people make it out to be, with the above step by step guide, and some patience your new toilet should be functional in no time.